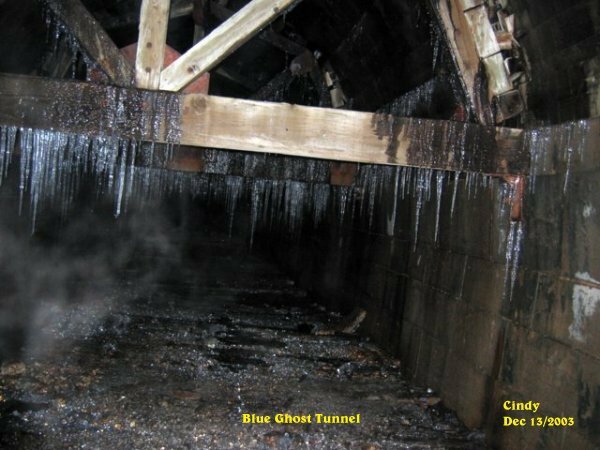 The above photo was taken towards the front of the tunnel just after our experience with the eerie sounds that came from the other end. This photo shows some energy forms just ahead of me. About 15 minutes later I could see something moving just ahead of where I was standing. I took a picture right away hoping to capture something. This energy form had a lot of energy to it as shown in the pic. Again notice the colors that are in the form. 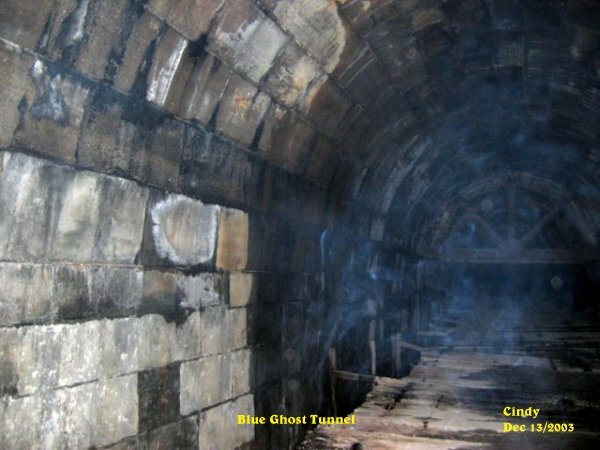 Cindy took the above photo as Cathy was trying to listen to the footsteps we all heard at the other end of the tunnel. Cathy had something forming around her when Cindy took this photo. Our friend Cindy and her daughter Alicia come out with us a lot. Cindy had no idea what kind of paranormal activity could be found. Now she is with us always on every investigation we do. 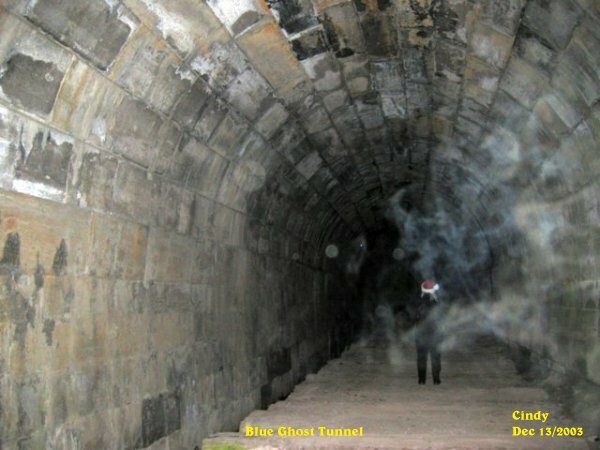 Cindy shortly after taking the above photo got some more ecto mist coming from the wall of the tunnel. Cindy got the same thing I had captured earlier down by the support beams of the tunnel. This was very similar to what I had gotten. 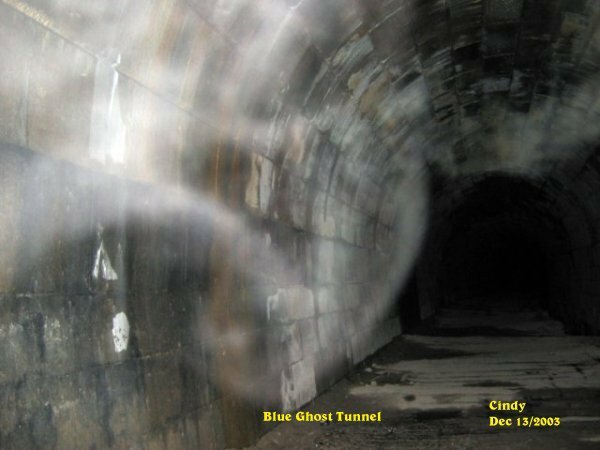 Cindy stood back from the beams and managed to capture this blue ecto plasm that seemed to be taking on a shape near the beams. 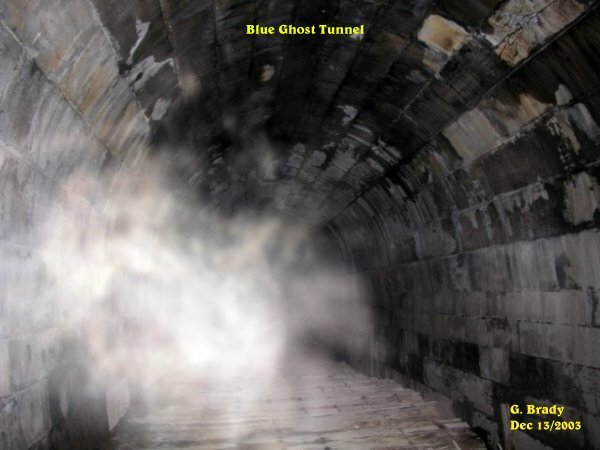 Again some more ecto mist coming from the same side of the tunnel. Just before we called it a night because it was getting to be 2:30 am, Cindy took this fantastic picture of the tunnel inside. 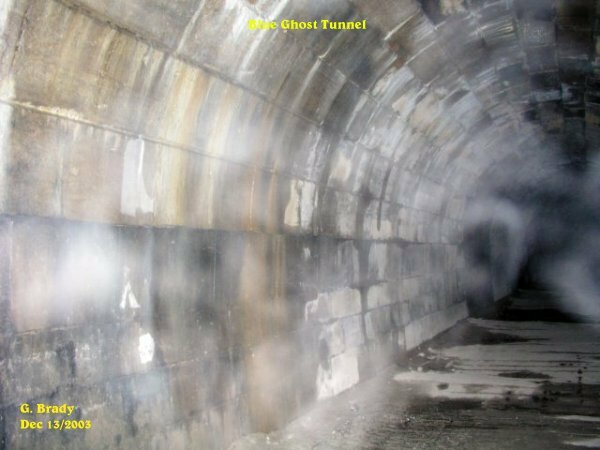 This picure shows some ecto mist along with ecto plasm. The real strange part of this photo is the way it showed in the picture. 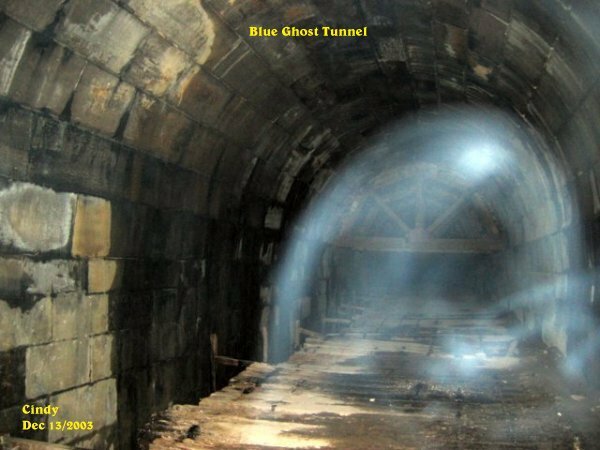 It almost looks like a gateway to another realm or a portal from the spirit realm to ours in the tunnel. The arch was so bright in color that it appears to have lit the whole tunnel with bright light. I told Cindy at the time that I was going to claim this picture but she told me NO WAY!! 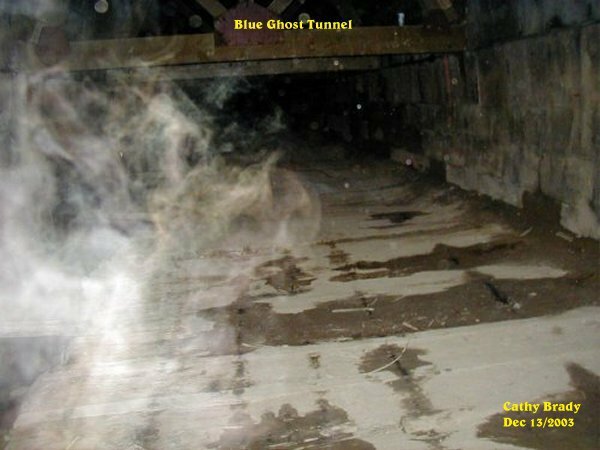 The above photo shows a lot of what energy looks like in the spirit realm. These type of photos are hard to get. We had a lot of ecto shots that were not posted. We are trying to keep the images down some and only taking what we think are good photos to share with folks that come to see what we had captured. 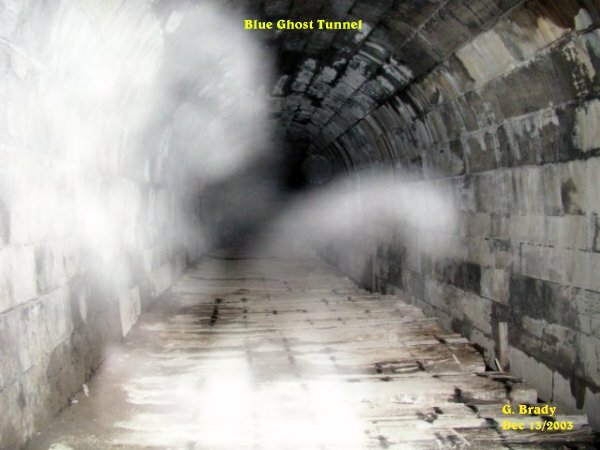 A lot of other paranormal researchers come to the tunnel to investigate this place known as the Blue Ghost Tunnel. So others outside of us have had their own experiences at the BGT. We hope that those that visited our site will go to the BGT and conduct their own investigation.